KEARNEY – What’s the best way to teach college students about the stock market? Give them $100,000 and the freedom to invest that money however they’d like. That’s the idea behind the University of Nebraska at Kearney’s William Bauhard Student Managed Investment Fund. The program, launched in 2014, turns business students into portfolio managers who work together to research, analyze and purchase securities using the knowledge they’re gaining in the classroom. “Our primary goal is experiential learning,” said UNK associate finance professor Suzanne Hayes, who teaches the investments and portfolio management courses that control the fund. The students – all seniors and mostly finance majors or minors – decide which stocks to buy or sell as a group. They select companies, complete equity research reports, then present their findings during stock-pitching sessions that occur three times a semester. It takes at least a two-thirds vote from the class and faculty approval to make a transaction. Adam Starr, a finance major from Mullen, said this isn’t the type of class where students can simply “slap a project together” at the last minute. Hours of research and preparation go into each report. “Students put a lot more time and effort into it, which is kind of cool to see,” said Starr, who started investing in mutual funds during high school. Working with actual money adds a level of pressure, but that’s part of the program’s value, according to Tristan Crook. UNK students such as Crook and Starr are learning to make sound investment decisions now so they’re prepared to enter the workforce after graduation. Starr plans on working as a financial adviser with Barth Financial in Kearney, where he interned last year and is currently job shadowing, and Crook will either remain with Barney Financial Services in Kearney as a financial adviser or pursue an opportunity with First National Bank in Omaha. The program taught Starr to trust his fundamentals and remain confident in his decision-making, especially during times of market volatility. “You’re not going to lose everything, it’s just part of how the market works,” he said. The benchmark for UNK’s Student Managed Investment Fund is to match the annual return of the S&P 500. “We’ve been successful in doing that,” said Hayes, noting that the fund has averaged a 13.5 percent return each year. The portfolio currently contains 32 different equity holdings – from Amazon and Apple to General Motors and Union Pacific – with a total value around $155,000. Once the fund reaches a certain level, profits will be used to create a scholarship fund for students in the College of Business and Technology. The William Bauhard Student Managed Investment Fund was established through the University of Nebraska Foundation with a leadership gift of $90,000 from Bill Bauhard of Omaha, a UNK alumnus and former financial services and telecommunications executive. An additional $10,000 was contributed to the fund through gifts from Jack Connealy of JFC Financial Services in Lincoln; Ron Eckloff, a certified financial planner in Kearney; Financial Leaders Student Association; Wells Fargo Foundation; and Securities America of Kearney. 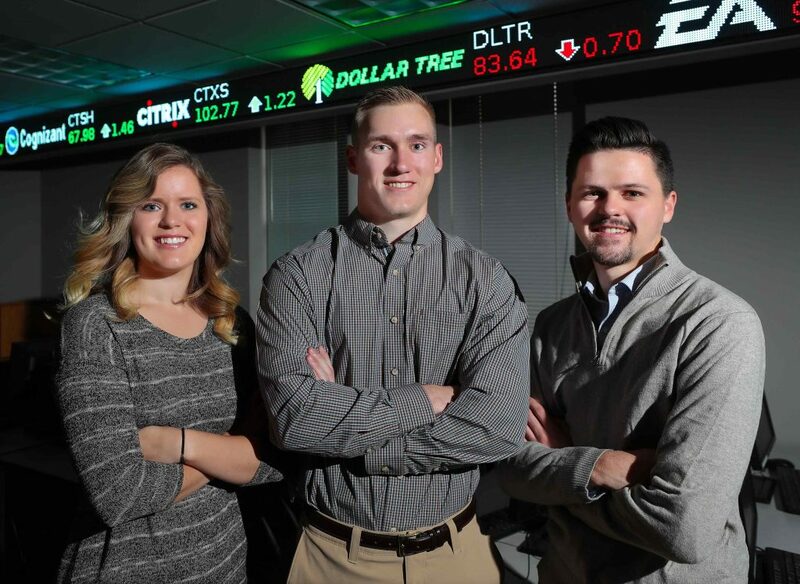 In addition to managing the fund, UNK business students also have the opportunity to participate in investment competitions across the region. Last spring, they attended the Rocky Mountain Investment Challenge hosted by Colorado State University, and this semester they were in Chicago for the Student Managed Investment Fund Consortium Conference hosted by Indiana State University.